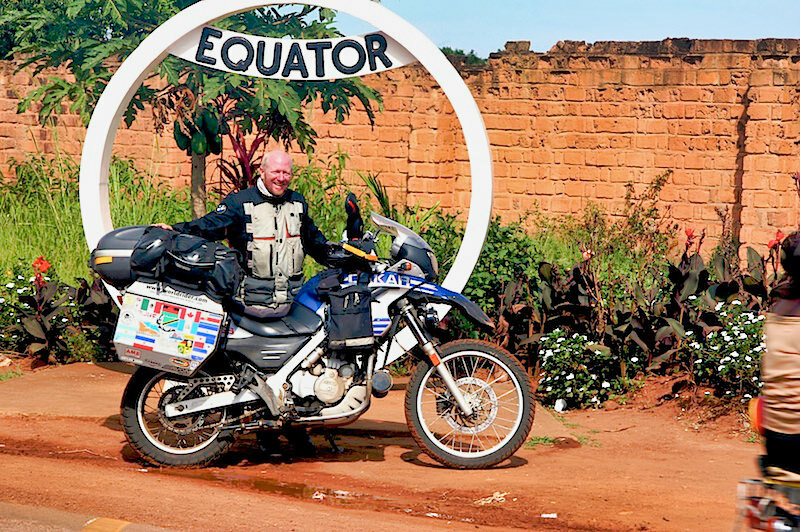 After a tranquil stay on Lake Bunyonyi I made my way to the Uganda capital, Kampala, crossing the equator for the second time during my journey. But unlike Ecuador’s equatorial monument, the Ugandan version was more modest — and more interesting. 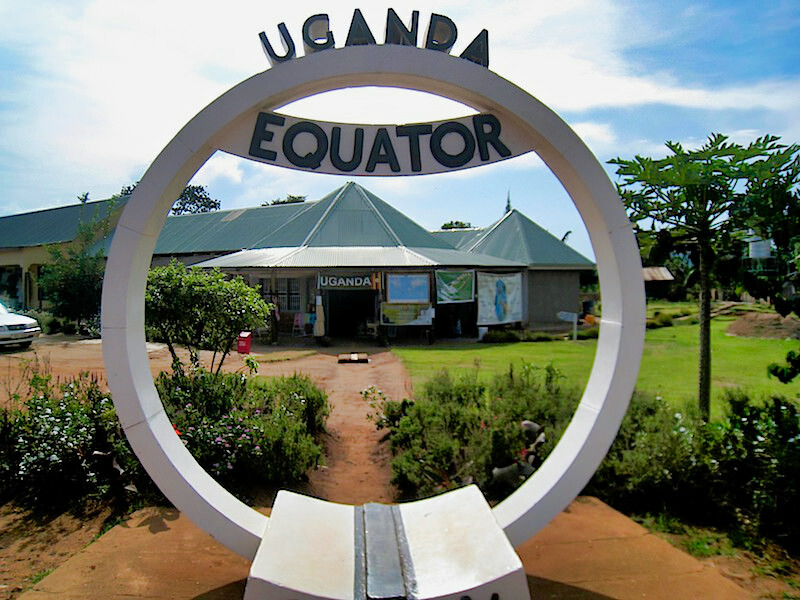 Here at the equator in Uganda there were three large funnels which emptied into larger containers. 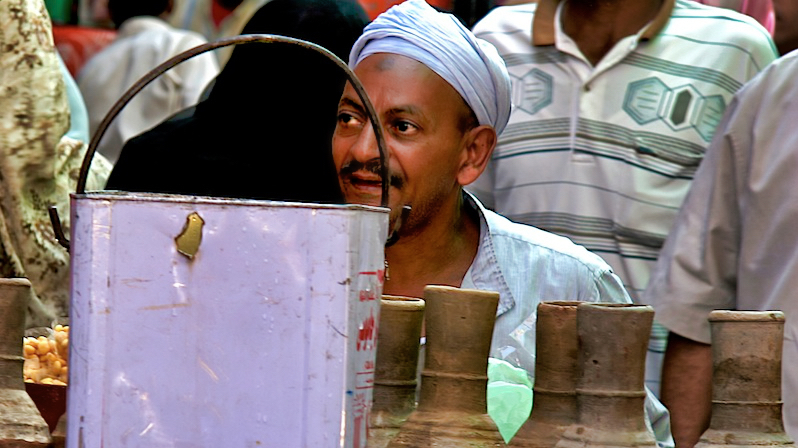 One on both the north and south side of the equator and one directly on the equator. Pouring water into each and placing a small daisy in the water, I was finally convinced that the water does drain counter clockwise below the equator; clockwise above the equator and on the equator it simply goes straight down. Moving the funnels closer and further away, it amazed me to watch the change of speed as the daisy spun slower further away and faster closer to the equator. It’s true folks. I saw it with my own two eyes. Equally interesting was the banana activity I witnessed nearly the entire three-hundred miles of road I traveled. Bananas everywhere. 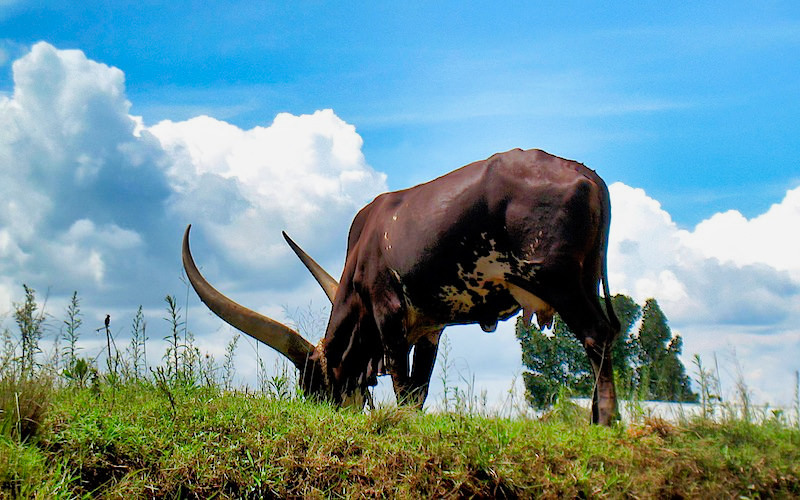 From Ntungamo to Mbarara to Lyontonde. And onward to Masaka. 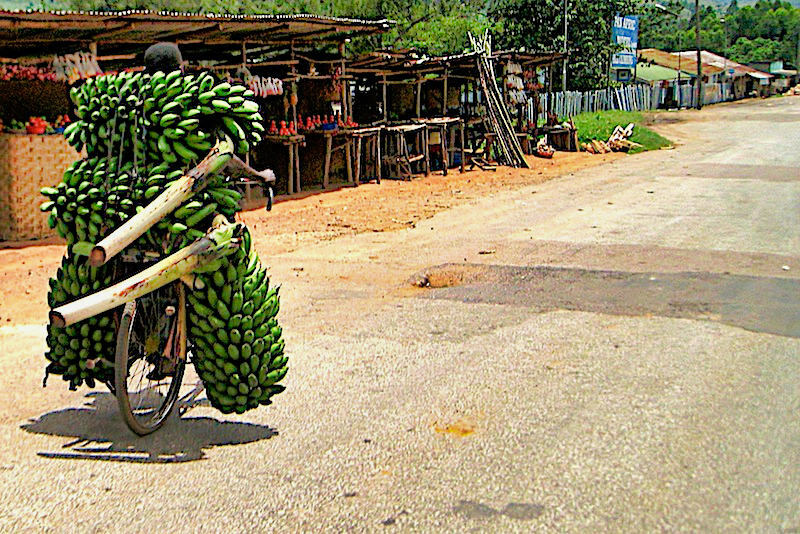 Bananas stacked over the rear wheels of biccyles and motorcycles as if they were banana panniers. People carried them on tops of their heads. 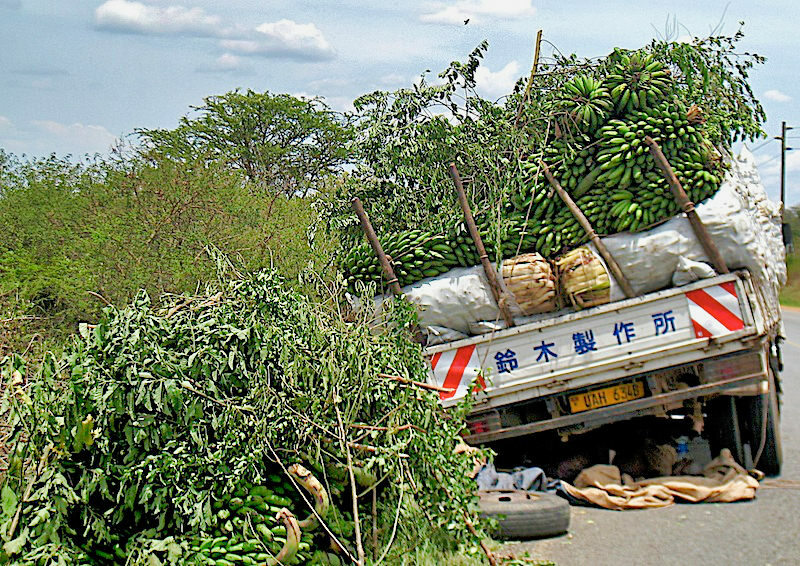 Massive trucks carried tons, often the weight perhaps a bit much for the aging iron as I spotted no less than a dozen trucks broken down – yet full of bananas – only soon to be continuing their banana journey. This part of Uganda is green, green and green. 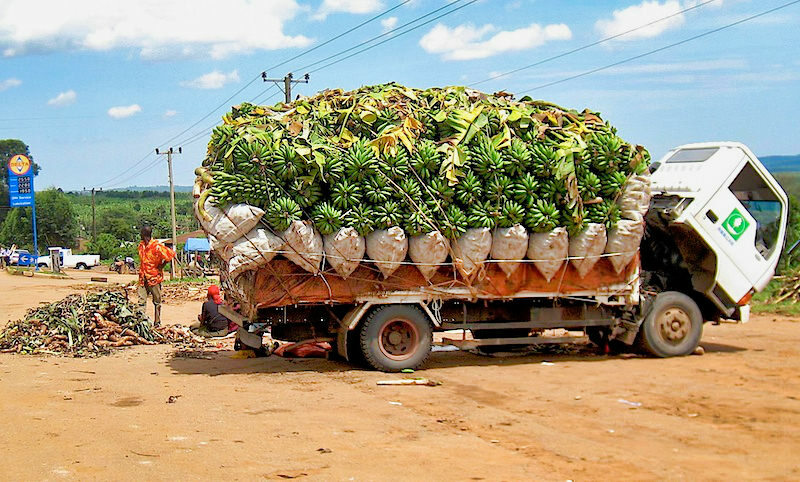 Yes, even the bananas in their transport state are green. Banana trees stretch for miles in the disance. 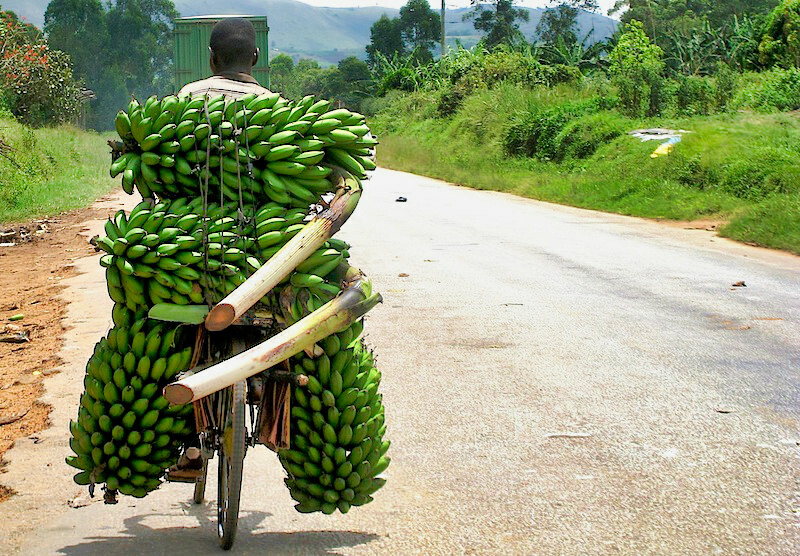 No, Uganda is even in the top 5 banana producers. Countries like India, China and Ecuador perhaps are the top three. 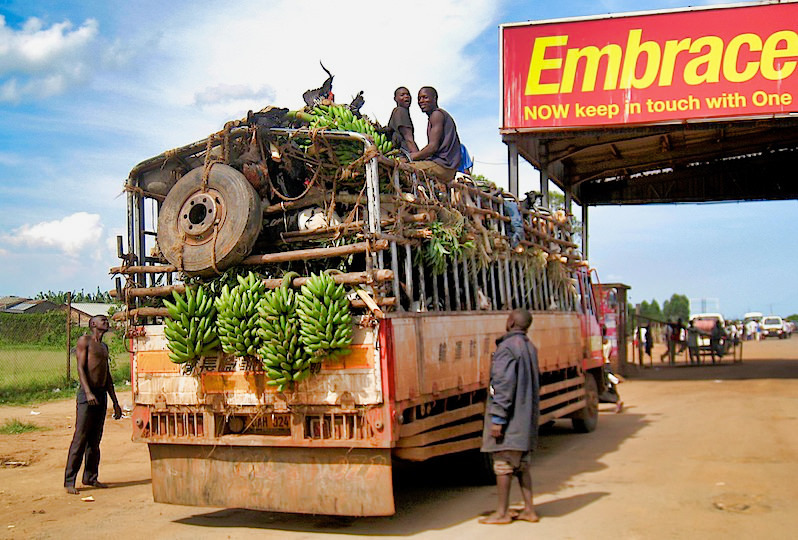 But in Uganda, bananas seem more than business. 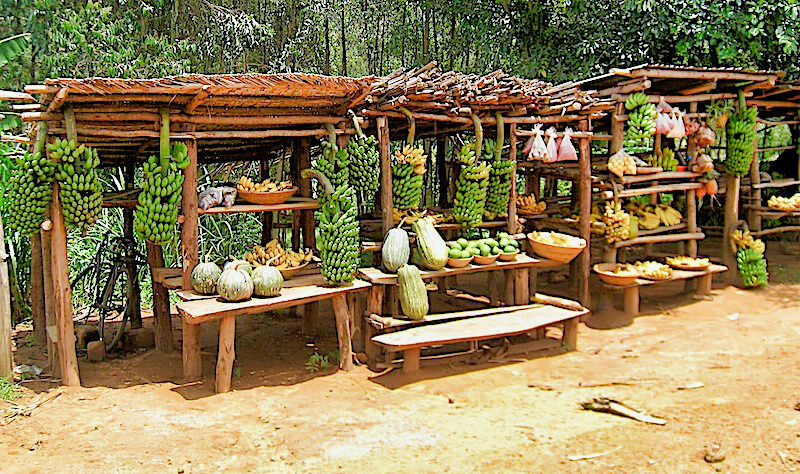 In a country where the average annual consumption of bananas per capital is 243kg, you mustn’t underestimate its important and a vital and staple food. 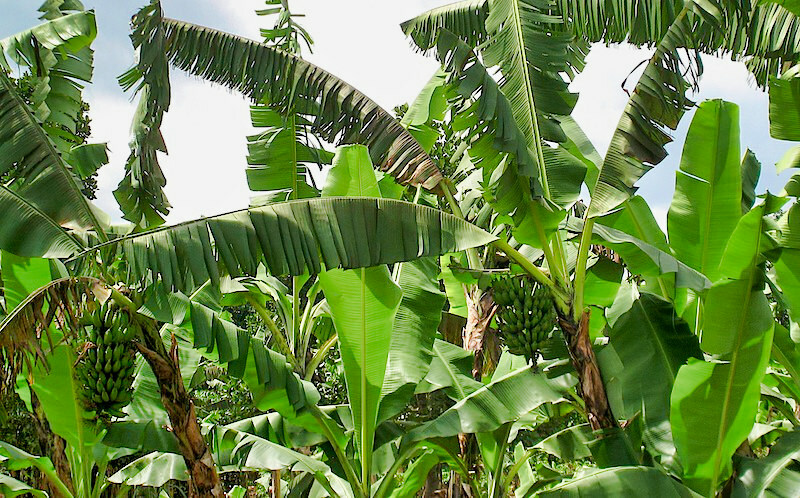 Some lucky villagers have bananas growing on trees in their front yards. I notice young boys hoisting up the trees and wielding large knives from goatskin sheaths which they use to cut the massive clumps of fruit from the tree. Yes. It’s true. Water does drain the opposite direction below the equator. I saw it. I thought of morning cereal, like Corn Flakes with freshly cut slices of banana and cold milk. A banana daquiri sure was sounding good. Hell, simply a banana smoothie. I thought of all the fried bananas I ate the last time I traveled through the Indonesian Archipelago. And how good would banana flambé be right now? But perhaps like a monkee or a gorilla, I just would like to stop and pull a fresh banana off a tree, peel the skin and bite it. Yummy. Yes. I’m in banana country. 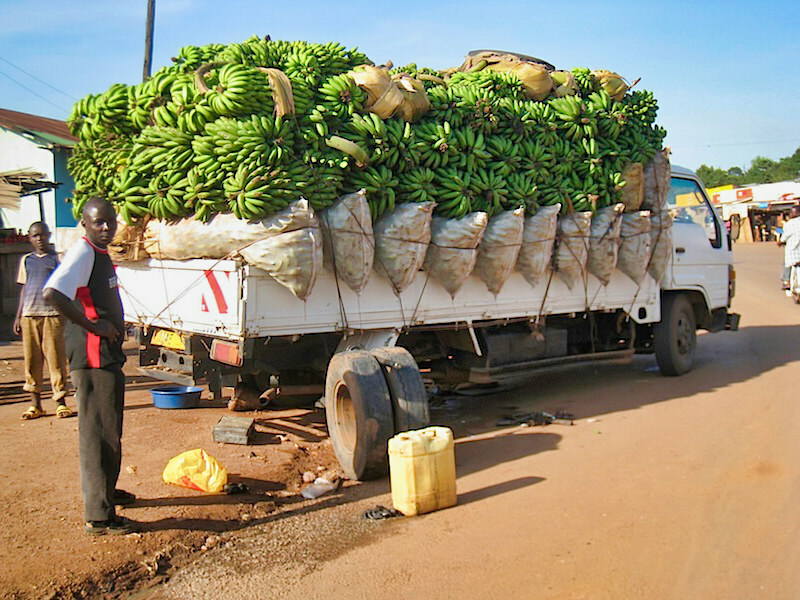 And the Ugandanas heere are serious about bananas. Judging from the activity on just this ONE day, I imagine this is life. Every day. Don’t know if I will ever look at a banana the same way. Sure. I’ve seen banana plantations. Lots on this trip. But by far this is the most dense and industrious movement of bananas I’ve ever seen. Bar none. This Long Horned beauty will certainly give any Texan a bit of horn envy. At a petrol stop in Masaka on Lake Victoria, I immediately attracted the usual gawkers and onlookers while the petrol station attendeants futilely attempted to whisk them away. Explaining that there are so many poor people in Uganda who cannot afford standard bus, taxi or mini-bus transport that ad-hoc transportation in the back of trucks, while dangerous and illegal in westernized countries, is an important mode of transport for people going from villages to the market and back. I had expressed interest and worry while explaining this type of transport is illegal in the USA. 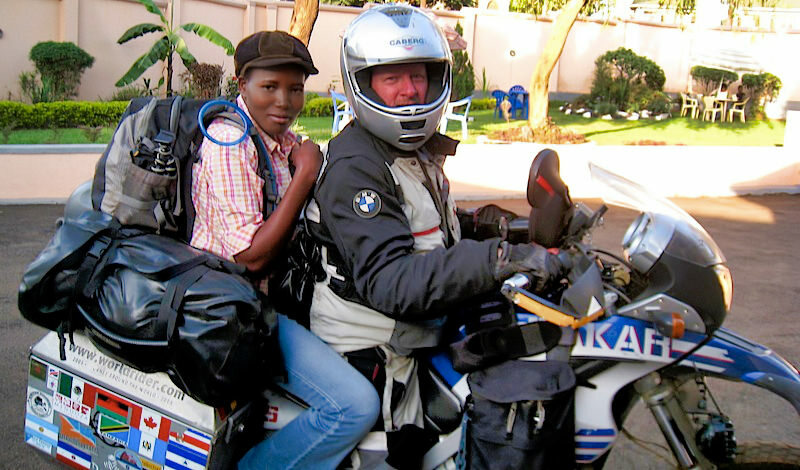 Even more, while spotting no less than five or six motorcycles carrying three or four people — all helmetless — I sadly expressed to my gas attendents that safety is not a concern in Uganda. 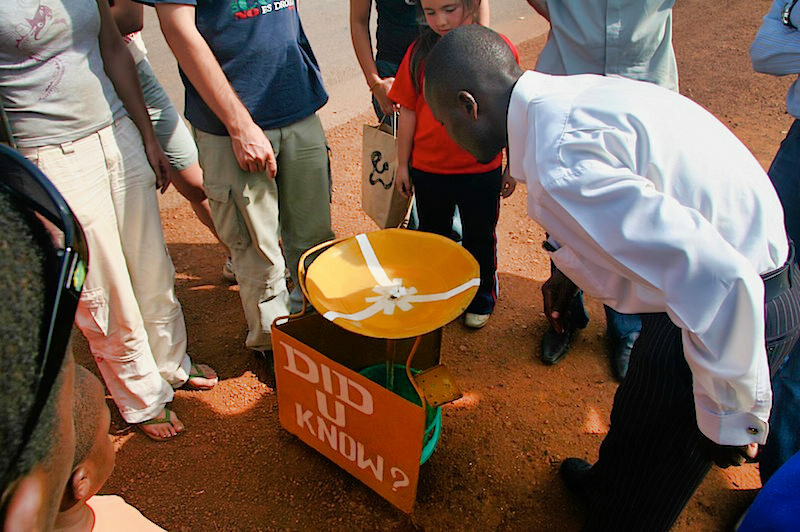 Although, HIV/Aids infection rates are perhaps the lowest in Uganda due to its government’s tenacity in education early on and before Aids Awarness became in vogue in Africa. I only hope that traffic and litter education will reach the government docket sooner rather than later. No helmets, no laws, no rules. No brains. Justine from Kampala guided me to the Equatoria Hotel where slow wireless internet access and secure parking awaited me. Traffic snarled on the two lane road heading into Kampala. A massive Mosque dominated the skyline of my approach so I headed for it. Later I learned that the Mosque has yet to be opened, and that sometime the following week its patron, Muammar al-Gaddafi, the Libyan president, would be in Kampala to make the dedication and officially open the Islamic fortress. But it was a hotel nearby the mosque and the lovely women working there who finally guided me into Kampala. I would have stayed at their hotel but they didn’t offer internet. 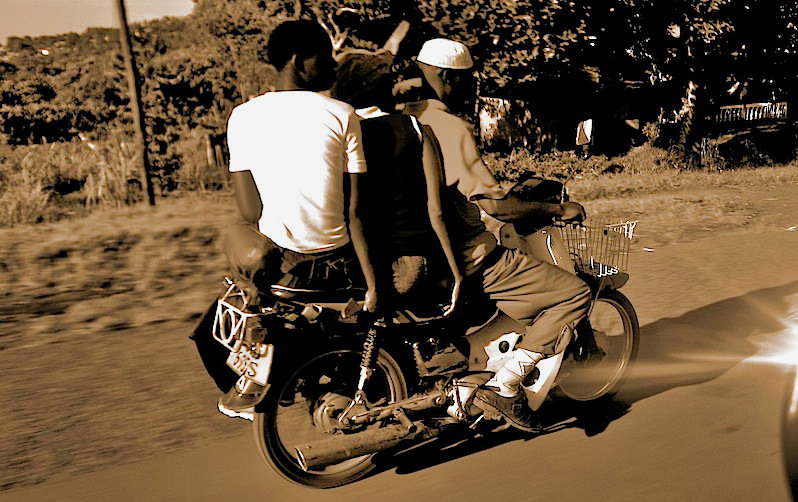 And any time I ride into an African capital city, I hope to find a place with an internet connection so I may catch up on these posts, email and business back home. Ahh. But Jonathan. This had nothing to do with volume of water but had to do with putting a small flower in the water and as it went down the drain the flower spun counter, clock or straight wise down depending on the location of the funnel at the equator. The Librarian needs to take a trip to Uganda as far as the water itself, well that’s tough to say but the force of the water in causing a small jasmine flower to spin is not arguable. It’s true!